A ton of design detail goes into our phones and computers. But with the charging cables, not so much. Almost inevitably, kinks and tangles make connections shoddy, and the charger starts to misbehave. Eventually, you end up tossing the junked charging cable and shelling out for another one . . . exactly like it. Break the cycle. 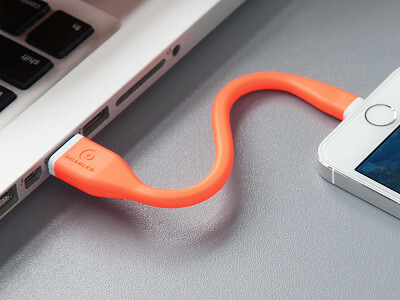 dCables are bendy, short USB cables that are made to last. A thick coating of super-strong, rubbery silicone helps them bend easily and fluidly. It makes so much sense—less stress on the connector housing where most chargers deteriorate. Also, dCables are a lot shorter than your typical charger, resulting in fewer tangles, and a lot more options for portable charging. 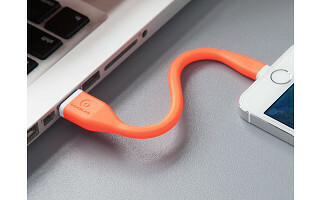 They can stay neatly plugged in, even in your pocket or purse. And you can easily keep several with you. Finally, cables as smart as the devices they charge. Hello everyone! I'm proud to launch the dCables, the super bendy, ultra durable USB charging cable on The Grommet. I'd be happy to answer any questions you may have. Any chance you will do the older iphone 4 usb cable? @Kimberly Thanks for the question, unfortunately, the market for that model just isn't big enough any more. @Brooks M. Are you kidding? There are a lot of people out here that have the older Apple products. In my household alone, we have three of the older Apple products and we won't be upgrading any time soon. The older cable style not only covers the iphone 4 but the first 3 versions of the ipad and most of the ipod designs. @Ted and Brooks... Ted is right, we have 3 iPhone 4S, 2 iPods, 2 iPads, and an itouch etc... you are missing out of a huge market is you ignore the older generation. It is not gone just because they are not selling 4S. I might upgrade my phone but I won't the rest of my products. @Ted I understand a lot of families have the iPhone 4 and earlier. The numbers we've seen indicate upwards of 85% of new iPhones sold are iPhone 5 and newer , with 6 and 6 Plus being 75%. As entrepreneurs we have to make tough calls on where to focus our time and limited funds. For this cable that means focusing on the Lightning connector and the Micro USB connector. We have USB Type C in development as well. I must add my 2 cents worth here. I understand where you are coming from because my son updates his electronics when anything new hits the market. Fortunately, for him, he can afford it and with the type of business he does, that's fine. BUT, as you must realize there are a lot of people out there, me being one of them, that cannot afford to do updates. Children want the latest...we know that. But parents have to choose between an update on electronics or saving for college. I beg to differ about your percentages. You evidentially are missing the picture here. I, myself, have an IPad 2 which I will not update until it's had it's last breath. You need to rethink your marketing skills and make a broader area. Right now, people look at what you are saying and think "ok, so he only caters to certain individuals". I have brought items from the Grommet and have been very satisfied but I am surprised about them sponsoring this product "to a special few". @Mary and others. We're definitely not trying to exclude anybody. I sincerely appreciate the feedback and we'll take your thoughts into consideration to decide if we should launch the Bendy cables for the 30pin connectors. Mary, just to jump off Brooks' point, this is a very young company and difficult decisions need to be made in what products to offer because they cannot afford to offer them all as he said. Unfortunately, that means it won't be a fit for every single device out there, because, as you said, there are updates all of the time. We understand that. But like your son, a lot of people gravitate to those updates which is where those percentages come from. We are not sponsoring to a special few. We are launching a new product from a growing business, we feel has real innovation. As they continue to develop, more products will be made available, as Brooks has said. @Mike "The numbers we've seen indicate upwards of 85% of new iPhones sold are iPhone 5 and newer , with 6 and 6 Plus being 75%." You seem to be missing the fact that your product isn't particularly aimed at *new* devices. What is useful, Jim, is that all of the devices you listed by Brooks utilize the same lightning charger. @Ronni Longer cords are in the works. Perhaps let The Grommet people know you're interested in longer cords and we'll launch that here after the Summer. A lot of people are surprised how useful the short cords are after they give them a try. @Holly I am looking for a longer cable also. @Holly What length , Holly? @Brooks M. Minimum of six feet, 10 feet would be terrific. @Brooks M - I would also like 8-10 feet. I bought another brand super cheap $3 and the USB micro cable is too long and it doesn't charge right. I'd love a reliable good quality cord!! Thanks - Just curious Where are your products manufactured? Hi Angela, dCables are manufactured in China. As far as the cord length you need, great news, it sounds like such a variety is in the works. Stay tuned! What's the difference between the Apple Certified and the non-Apple Certified USB Bendy cable? I assume they both work identically, yes? 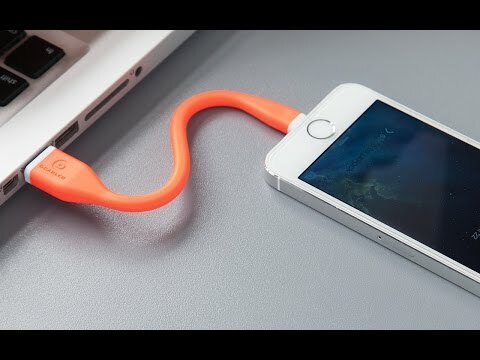 @Steve The Apple certified Bendy has the Lightning Connector for use with phones like the iPhone 5 and 6, and newer versions of the iPad. The other Bendy Cable has a Micro USB connector, which is used in a lot of Android phones, cameras, power banks, etc. Do you make longer cables? @Susan we hope to be able to launch the 1 meter( 3 foot version) by around the end of the summer. @Dena and anyone else who asked for longer cables. Can you tell me what lengths you'd prefer? Thanks! @Brooks M. I think anything even remotely longer than the standard yard-long Apple cable would be the world's biggest improvement. I have a Motorola phone and bought a 10 ft. cable, which is extreme, sure. But any additional length would be, in my opinion, a huge selling point. The standard Apple cable is 3 feet. Got plenty of those and they are too short! Please consider longer than the standard 3 foot. Sounds like it is on its way, Anna. Stay tuned! Are these charging only? Or will they also allow syncing? @Frank On Apple devices they charge and sync. On most Android devices it kind of depends on the model. I have a Samsung Galaxy S5 phone. The micro USB has gone away to a larger USB. Will you be creating one of those as well? Great product! @Mathew The Micro USB Bendy will charge the GalaxyS5. You just insert the Micro USB connector into the smaller portion of that larger USB3.0 port. We're working on Bendy cables for the USB Type C connectors. That's the new one that's reversible though hardly any devices are using that connector yet. Are these small enough to fit into the Lifeproof case? Basically they have to be the same size as the original Fire Wire Cable end. @Sandra They will definitely fit the Lifeproof case for iPhone 5. We haven't tested the iPhone 6 Lifeproof case but we've been told it might NOT fit. @Brooks M. I have the iPhone 6, is there any way you can test? @Sandra do you know the dimensions of the opening in the Lifeproof 6? The connector housing on our Bendy cable is ~5.9mm tall X 9.85mm wide. I see and understand why your company has focused on the cables that you are selling. While I have several older ipod, ipod touch and an Ipad2 in the house, many of the newer purchases use the lightning cable. This product is much more durable than the standard Apple Branded Cable. The Micro Usb and USB C cables are pretty ubiquitous across different manufactures, so I see the logic in this as well. Many of the older devises with sealed batteries are nearing the end of their "useful life". The Iphone 4, 4s and older models may have been top sellers, but I am guessing those of us who pay the price for annual or frequent phone upgrades, won't mind buying premium cables. For those complaining, it's basic marketing and I am sure they have done their research. Their target market are those with devices with the mentioned connectors. I do wish that you had LONGER cables available though. If you are successful, I strongly encourage you to offer longer cables as well, when you are ready to expand. @Aaron any thoughts on what length you'd like to see? How do you use the cables for charging? In the car, on a desk, on a countertop, power bank, etc? @Brooks M. The best option would be to have a 3-4 ft USB cable with an adapter or two. A lot of people charge their phone at night &/or in the car, when it's better to have more length. Have you considered doing laptop adapters? That is actually the only one anyone in my family have had any problems with, so that's another available market there. @Lisabel I'm not sure I understand, Lisabel What do you mean by laptop adapters? I think she means what I would be interested in, too. A charging cable for my iPad and for my MacBook Pro. Hi Deborah and Lisabel, I'm not sure if what you're looking for is offered. You can connect a dCable to your laptop to charge your device. However, I'm not sure there is an adapter to charge your laptop. Unfortunately, you might have to stick with the charger that came with your laptop unless Brooks has something else awesome up his sleeve. I use Blackberry and Android devices. Not all USB cables permit the transfer of data. Do these? Hi Francis, as Brooks said above, it depends more on the model of your phone than the type of USB cord. Is there any chance you will market a USB extender cable of the same length? I have a dongle for expensive software, and I'd love to have something better than the lightweight extender (6 inch) that I use now. Dot and Gail, it sounds like such a model is in the works. Stay tuned! just an idea....how about an adapter to convert lightning charger to the old larger type charger for those of us who DO NOT need the latest version because our older product works fine for our needs and desires? With such a cable we could power old and new devices! 12 inches would be a great length for these, 6 is SO short. Will the Apple Certified cable fit Ipad Air 2? Hi Terri, unfortunately the Apple certified cable will only work for iPad 4th generation and above.